The christmas card scrapbook is such a great idea! I am going to have to do that! We (ok that would probably be a little more me) LOVE getting holiday cards:) Your hearing and sniffer are also enhanced when your preggy, what in the world are you going to do then, haha.you're going to become a super hero! Girl, I lost my humidifier when we moved and I SWEAR it's driving me crazy. I can't find it and I NEED it! And I can't believe you're keeping Christmas cards - that's crazy. We get so many every year that we'd have stacks and stacks of scrapbooks - it's just too too much! I'm glad to know that I'm not the only one that thinks popcorn smells like urine. Everything I touch in the winter time gives me a shock. It's one of the worst feelings in the world. I've never noticed the popcorn smell thing, I'll have to pay attention next time I'm eating it. HAHA! I'm Christmas Card Crazy too! Sometimes I feel so oldschool about it but I just love sending them and receiving them. THere's something quite exciting about getting them in the mail i think! I like your idea of saving them...I think I may have to start doing that! Haha! I had to LOL when you mentioned popcorn smelling like urine. One of my coworkers loves making popcorn in the afternoon, and that smell drives me nuts! I thought I was the only person in the world who was reminded of the toilet by the smell of popcorn. Maybe we should start a support group. I also have such a heighten sense of smell, it's bananas. I love the idea of keeping all the Christmas cards in a book. I'm officially stealing your idea! Oh we love our humidifier too. Makes the dry air so much nicer. I love the idea of keeping all of the cards you got! What a great idea! That's a great idea for keeping your cards...I can't bear the thought of throwing them all away either! Oh my word! I have the exact.same.problem with the static. I do this weird thing where I touch the car door with my elbow before I touch it with my hand because if I don't I will get shocked. Never fails. I love your Christmas card book idea. I save the ones we get but they're just in a box -- the scrapbook idea is much more creative! That is such a good idea about the Christmas cards! I also have a problem that ALL year EVERY day, whenever I open my or shut my car door I get shocked. It has come to the point that I will kick the door closed or put my hand in my sleeve. It never fails to shock me. What a great idea for the Christmas Cards! I have stacks and stacks of them along with my birthday cards since my birthday is 2 weeks before Christmas! I'm going to have to try that out! Sometimes those shocks really hurt! Like more than they should. I shocked baby boy twice today. I felt bad. I think he thought I did it on purpose. I totally know where you are coming from, we have several of those bad boys in our home! 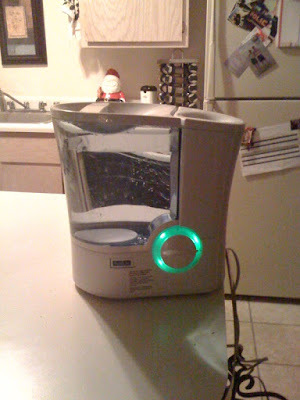 A humidifier? Genius. I'm so plugging in our kiddo's!